Those of us who get to visit Disney World are fortunate to get to go, but there are lots of deserving people who will never be able to make the trip, and that’s where you come in! This 3 night, 4 day trip to Disney World is going to be awarded to somebody who is nominated by you. What makes them deserving? You tell us! We’ll read through the submissions and choose the one that we like best. Congrats to Valerie Holt for winning the Disney World trip giveaway! 1. PROMOTION DESCRIPTION: The 3 NIGHT, 4 DAY DISNEY WORLD TRIP GIVEAWAY ("Giveaway") begins on May 12, 2017, at 7 a.m. eastern time and ends on May 19, 2017, at 5 p.m. eastern time (the "Promotion Period"). The sponsors of this Giveaway are Prep School Productions, Inc. and Key to the World Travel ("Sponsors"). By participating in the Giveaway, each Entrant unconditionally accepts and agrees to comply with and abide by these Official Rules and the decisions of Sponsors, which shall be final and binding in all respects. Sponsors are responsible for the collection, submission or processing of Entries and the overall administration of the Giveaway. Entrants should look solely to Sponsors with any questions, comments or problems related to the Giveaway. Sponsors may be reached by email at [email protected] or [email protected] during the Promotion Period. 2. ELIGIBILITY: Open to people who are 18-years-old (the "Entrant"). Sponsors, and their respective parents, subsidiaries, affiliates, distributors, retailers, sales representatives, advertising and promotion agencies and each of their respective officers, directors and employees (the "Promotion Entities"), are ineligible to enter the Giveaway or win a prize. Household Members and Immediate Family Members of such individuals are also not eligible to enter or win. "Household Members" shall mean those people who share the same residence at least three months a year. "Immediate Family Members" shall mean parents, step-parents, legal guardians, children, step-children, siblings, step-siblings, or spouses. This Giveaway is subject to all applicable federal, state and local laws and regulations and is void where prohibited or restricted by law. - One Resort Rapid Fill mug per person, per package (eligible for refills at Quick-Service locations at your Disney Resort hotel during their length of stay). Moderate Resorts included: Disney's Caribbean Beach Resort, Disney's Coronado Springs Resort, Disney’s Port Orleans Resort – French Quarter and Disney’s Port Orleans Resort – Riverside. Valid for redemption most nights in 2017, excluding holidays and some peak times. Blackout dates for this package are 5/25/2017-5/28/2017, 8/31/2017-9/3/2017, 11/9/2017-11/12/2017, 11/22/2017-11/24/2017, and 12/23/2017-12/31/2017. 4. 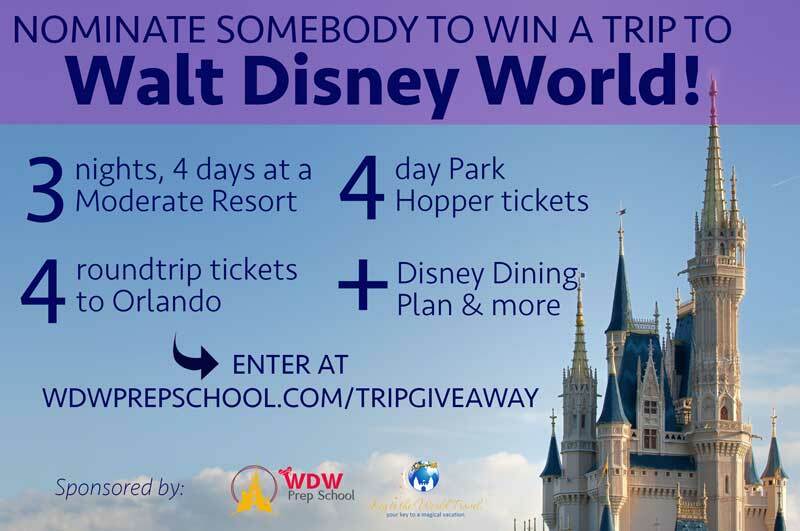 HOW TO ENTER: Enter the Giveaway during the Promotion Period online by visiting the entry form, which can be found on the following website at WDWPrepSchool.com/tripgiveaway. 5. WINNER SELECTION: The Winner(s) of the Giveaway will be selected by Sponsors from among all eligible Entries received throughout the Promotion Period. The selection will be conducted by May 26, 2017, at 5 p.m. eastern time after the Promotion Period by Sponsors or its designated representatives, whose decisions are final. Odds of winning will vary depending on the number of eligible Entries received. 6. WINNER NOTIFICATION: Winner will be notified by email at the email address provided in the Entry Information by May 26, 2017, at 5 p.m. eastern time. Potential Winner must accept a prize by email as directed by Sponsors within 7 days of notification. Sponsors are not responsible for any delay or failure to receive notification for any reason, including inactive email account(s), technical difficulties associated therewith, or Winner’s failure to adequately monitor any email account. Any winner notification not responded to or returned as undeliverable may result in prize forfeiture. No substitution or transfer of a prize is permitted except by Sponsors. 7. PRIVACY: By entering the Giveaway, you grant Sponsors permission to share your email address and any other personally identifiable information with the other Giveaway Entities for the purpose of administration and prize fulfillment, including use in a publicly available Winners list. 8. LIMITATION OF LIABILITY: Sponsors assume no responsibility or liability for (a) any incorrect or inaccurate entry information, or for any faulty or failed electronic data transmissions; (b) any unauthorized access to, or theft, destruction or alteration of entries at any point in the operation of this Giveaway; (c) any technical malfunction, failure, error, omission, interruption, deletion, defect, delay in operation or communications line failure, regardless of cause, with regard to any equipment, systems, networks, lines, satellites, servers, camera, computers or providers utilized in any aspect of the operation of the Giveaway; (d) inaccessibility or unavailability of any network or wireless service, the Internet or website or any combination thereof; (e) suspended or discontinued Internet, wireless or landline phone service; or (f) any injury or damage to participant's or to any other person’s computer or mobile device which may be related to or resulting from any attempt to participate in the Giveaway or download of any materials in the Giveaway. If, for any reason, the Giveaway is not capable of running as planned for reasons which may include without limitation, infection by computer virus, tampering, unauthorized intervention, fraud, technical failures, or any other causes which may corrupt or affect the administration, security, fairness, integrity or proper conduct of this Giveaway, the Sponsors reserve the right at its sole discretion to cancel, terminate, modify or suspend the Giveaway in whole or in part. In such event, Sponsors shall immediately suspend all drawings and prize awards, and Sponsors reserve the right to award any remaining prizes (up to the total ARV as set forth in these Official Rules) in a manner deemed fair and equitable by Sponsors. Sponsors and Released Parties shall not have any further liability to any participant in connection with the Giveaway.